The in-situ hybridization of the oligonucleotide probe for the core consensus sequence of the 33bp repeat minisatellite (33con) shows a similar distribution like the telomere sequence of Arabidopsis thaliana. The loci could be found at the ends of all chromosomes or the tHC (figure a). The signals of the oligonucleotide probe for the core consensus sequence of the M13 minisatellite (M13con) were observed on all chromosomes, but always at the cHC and especially at the same position as the strong DAPI bands (Figure b). Figure: FISH signals (yellow-green, see arrow heads) of two minisatellite core-consensus sequences on polytene chromosomes of Phaseolus coccineus. 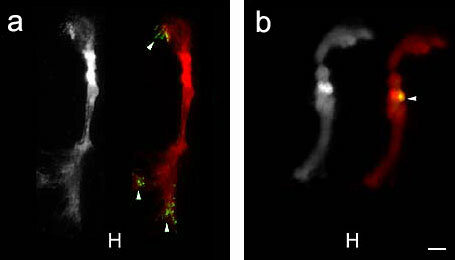 Chromosomes are counterstained with DAPI and displayed here in grey or red. (a) Signals of 33con at the tHC of chromosome H representative for all the other chromosomes. (b) Representativ signals of M13con at the cHC of chromosome H. On all other chromosomes the probe hybridizes at the same location. The scale bar represents 10 µm. 04/26/2019 2:50 Phaseolus polytene chromosomes by Mario Nenno. © 2008- All rights reserved.